It's kind of a big deal. When I went to go pick up my packet yesterday the girl at the table asked me which distance I was running. When I heard the words "Fiiiftyyy miiiile" come out of my face it almost felt like some robot entity took over my body and while I recognized the tone of my own voice I wasn't sure who or what was forming the sounds. This is the girl who three years ago just wanted to finish her first 5K. I do remember at the finish of that race thinking, "Yeah, I could do twice that. If I worked hard enough." And THAT my friends, is how things can begin to spiral out of control. Jason keeps asking me if I'm done at 50 or if I will ever get the bug to run 100 after this. Although he is supportive and proud of the things I've accomplished I can tell that this time it's asked with trepidation. As in, "You're done after this distance... right?" Although I don't see myself being done running ultras, I also don't feel like I'm going to need to keep going farther and farther after this point. I know that I really love the 50K distance. I love running marathons. 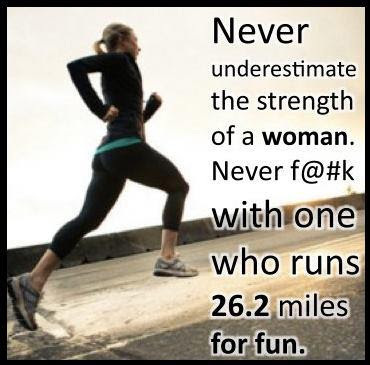 I also really enjoy running half marathons. Hey, I could even see myself going back to 5Ks and trying to PR there. There's just so much out there to do, so many trails to run, so many things to see. I'm excited to see where this journey takes me from here. But first I have to run fifty miles. Thanks to Krista for this one. Looking forward to hugs and glitter at the finish line! I adore this image, and I know that you already ran the race, and you're amazing!!! I'm signed up to do my first 50k in 3 weeks in Moab, and am scared about getting my foot up to speed (it took a shitter 2 weeks ago after a 20 miler on Friday and a 10 miler on Saturday). I know I can do it... I think. You're completely inspiring!!! Thank you!! !